Jupiter Inlet Cove is a small Intracoastal condo with just 6 units with a park like setting and the Intracoastal behind it. They have two or three bedroom floorplans and each has a beautiful porch or balcony overlooking the community pool, Intracoastal and Jupiter Lighthouse. The community sits at the mouth of Jupiter Inlet. Each condo has ther own extra large 1 car garage with storage in the garage attic. Plenty of space for a large car and bikes. The community has a beautiful pool and green space behind the condos. Walk out to your own private boat dock which will hold a 35ft boat. This is Old Florida at its best. One of my favorite communities. Condos in here very seldom come up for sale. Boaters you'll love Jupiter Inlet Cove. 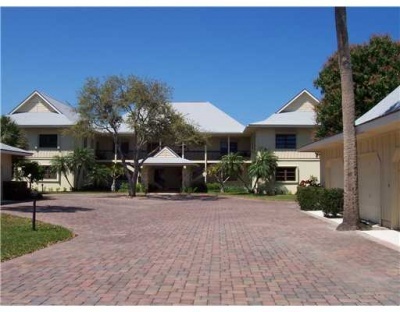 Boaters check out more Jupiter waterfront homes which offer easy access to the ocean. Browse listings for available Jupiter condos, or Read more & see aerials of Jupiter Inlet Cove condos in Jupiter. Not only is the spacious size of the units in Jupiter Inlet Cove a huge draw to live her in this community but the back yard behind the 6 condos has plenty of green space as well as a beautiful private pool to enjoy. The docks feature spots to store kayaks where you can easily launch into the crystal blue ocean waters coming through the inlet and paddle up to Jupiter Island. Feel free to spend some time at the sandbar at chat with paddleboarders and fellow kayakers. The entire time you will see the Jupiter Lighthouse and you will pass the beach community of Jupiter Inlet Colony on your paddle by. Dubois Park is just across the water or a short walk by foot where you can spend some time in the shallow Estuary pools of water or fish at the Inlet. Just around the corner you will find other Jupiter beach condos that may fit your needs and wants. With so few condos in this community they rarely come up for sale so other places such as Jupiter Dunes, Jupiter Harbour or Ocean Trail on the beach may suit your needs. This little pocket of Jupiter condos is a great place to call home. Just minutes from the action of The Funky Fishing Village with waterfront restaurants and bars you will always find plenty to do. Take a bike ride along the Beach Rd down towards Juno Beach and spend some time there at the beach. Call us to help you find a perfect Juno Beach condos for you. Search for more real estate on our websites below. You will find Singer Island homes for sale, Hutchinson Island Condos and Highland Beach condos for sale. We cover the coast and specialize in beachfront communities as well as Jupiter single family homes. If a Jupiter Inlet Cove Condo listing has caught your eye or you want more information about Jupiter, FL real estate, please don't hesitate to call 1-561-744-7025, or email via our handy contact form with any questions or to arrange a showing.